Last week was Remember a Charity’s annual awareness week – Remember A Charity In Your Will Week – and we wanted to help start some conversations about the state of legacy giving in the UK. Remember A Charity is a consortium of over 200 charities, whose sole purpose is to normalise the idea of leaving money to charity in your will, after you have looked after your friends and family of course. 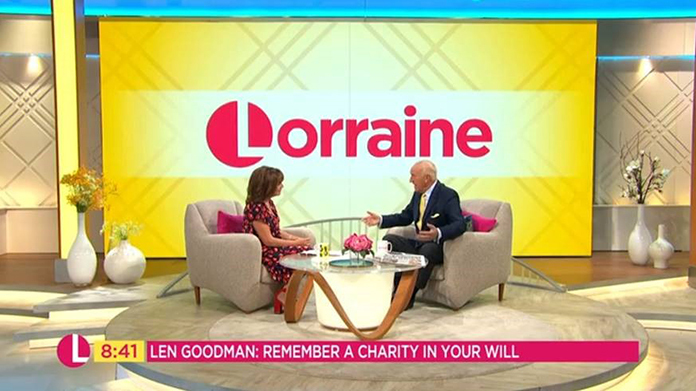 It’s a tough subject, talking about what happens when we’re gone, but our ambassador Len Goodman (of Strictly fame) managed to waltz seamlessly into the nation’s hearts. His earnest endorsement, coupled with some great statistics on the increased generosity of the UK, meant that a lot of people were keen on hearing what we had to say. Len, who actually changed his Will after hearing about Remember a Charity, was a hit on ITV’s Lorraine as well as on talkRADIO and over 15 local BBC stations. We secured amazing print coverage in The Sunday Times, Daily Star, Metro, Mirror and Express (four times in one paper!). As well as further online hits on The Daily Mail, The Sun, Metro, Express, Mirror, ITV.com, Good Housekeeping, Prima, Hello!, Digital Spy and Entertainment Daily. We even managed to get #rememberacharity trending on Twitter. Ultimately this campaign was about making a difference and we’re proud to have played our part in normalising legacy giving in wills.